How much would you pay to never have a hangover again? Think of how your last hangover felt. Hangovers are caused by toxins, DrinkersChampion eliminates those toxins, therefore you will never feel the effect of a hangover again. Don't let a hangover ruin your day. DrinkersChampion is the hottest prevention product on the market, do not miss your chance to ORDER NOW! Never feel the effects of a hangover again, all for less than a dollar per hangover. 60 capsules for $24.95. 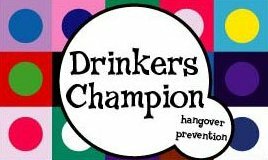 DrinkersChampion is a specially designed formula that PREVENTS hangovers. It is not a cure, it allows you to wake up feeling good instead of waking up with a nasty hangover then trying to recover from it. All you do is take your proper doseage while you are drinking and then wake up feeling great! You will never need a hangover cure again. thank you later. It is that simple. Don't let a hangover ruin your day. DrinkersChampion is the hottest prevention product on the market, do not miss your chance to order this extraordinary product.